They heard about Bitcoin years ago and chalked it up as cool tech, but either didn’t have enough faith in it at the time or just forgot about it. After a gathering with family or friends, they heard about the massive price fluctuations with Bitcoin and wanted to see what all this commotion is about. There’s someone in their office who’s mood depends on which coin is gaining momentum or losing traction that day, and doesn’t really talk about much else, and they want to understand what’s going on in their mind. Some people want to get into cryptocurrencies for the sake of investing into some awesome and upcoming technology which will be the future. Others, simply for the possibility of some quick profit. No matter your motivation for getting started with cryptocurrency, you’ll learn a lot from this article and will be able to easily purchase your first cryptocurrency of choice, learn how to do your research when choosing coins other than those coins offered on Coinbase, and storing your coins properly. I wanted to make a simple and easy to follow guide on getting started. 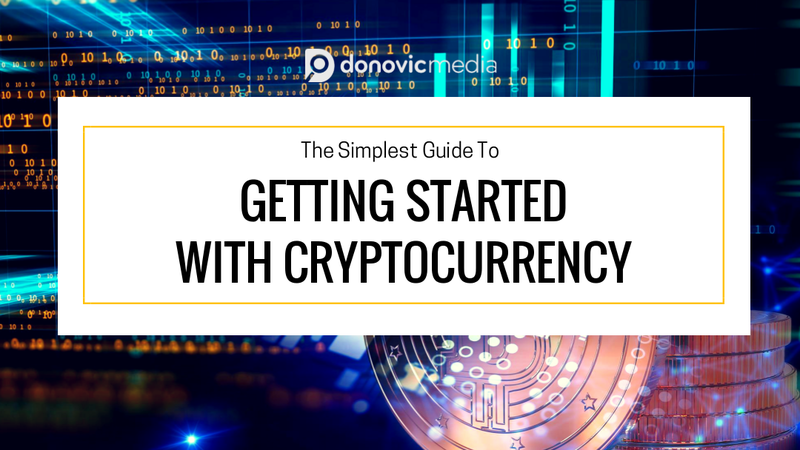 I’m sure you’ve just wondered “How do I get started with cryptocurrency?” Well, without any further ado, here’s the Donovic Media guide on getting started with cryptocurrency. Cryptocurrency, simply put, is a type of digital asset that is characterized by secure transactions via cryptography. The first decentralized cryptocurrency, and arguably the most famous, was Bitcoin. Bitcoin was built on blockchain technology, and its major draw was its decentralization, as opposed to a centralized banking system. This allowed for a certain level of anonymity and security. Since Bitcoin, many other alternative cryptocurrencies (also known as altcoins) have been created on blockchain and similar technologies. These alternative cryptocurrencies can serve many functions. For example, there’s Ethereum, which features smart contract functionality. There are other tokens such as Modum which has the aim of preserving data integrity for pharmaceuticals via blockchain technology. For example, if a medication needs to be kept at a certain temperature, using Modum’s technology would allow for the information from point A to point B to be “untamperable”, thus ensuring that it was (or was not) kept at the temperature it was supposed to be kept at. Phew! So that’s cryptocurrency in a nutshell. There’s much more, but that would be a series of posts on their own. Here, you can view the charts on Bitcoin, Ethereum, Litecoin, and Bitcoin Cash, as well as a quick history on cryptocurrencies bought, sold, sent, and received. But before you can buy anything, you’ll need to link your bank account or credit card. Click the “Settings” button. Then, click Linked Accounts, and then click “Link a New Account”. You can use your credit/debit card, or you can also link your bank account. Using your credit or debit card to purchase is quick, but they add an extra fee. Your bank account usually takes about a week, but there’s fewer fees. In order for Coinbase to verify that you’re actually using an authorized account, they’ll do two small verification transactions (under $1 each). This may be instant if you used your card, or it may take a couple days for your bank account, but if you have online banking, they will generally show up under pending transactions. Note: Your bank or credit card may deny your transaction from Coinbase initially and place a freeze on your account. It’s a toss-up. Before you proceed to buy anything, I’d recommend calling them up and letting them know that you’ll be making a purchase on Coinbase with that bank account or card. Save yourself that headache of a cancelled transaction. To buy, click the Buy/Sell button at the top of your menu. Second, select which cryptocurrency you want to buy. Third, select your payment method. Fourth, you can type in the amount in USD you’d like to purchase, or you can type in the amount of the cryptocurrency you’d want to purchase. Note: You can buy in fractions, and DO NOT need to purchase a whole Bitcoin, Ethereum, or Litecoin. As you see in my example enough, you can buy 1.3216 of a Litecoin if you’d like. You can buy 0.005 of a Bitcoin as well. As I write, even that is nearly $100. Finally, you click that blue button at the bottom. A popup will ask you if you’re sure. If you’ve got 2 factor authentication on, you will need to verify before you can purchase it. Coinbase is the most popular and simplest way to purchase cryptocurrency with USD (United States Dollar), but there are alternative methods as well. One of the simplest ways to buy alternative cryptocurrencies with USD is with Changelly. You can also purchase alternative cryptocurrencies using your own cryptocurrencies you’ve already accumulated. Make sure though that you have a proper wallet that will support the cryptocurrency you’re looking to buy. They’ll require it upon checkout. I’ve heard great things about Gemini. Unfortunately, I am unable to use it since they’re not operational in my state. They operate in 47 of the 50 states, as well as countries like Canada and Singapore. If they’re available in your jurisdiction, they’re worth a try as well. The exchanges allow you to get into different alternative cryptocurrencies that are not listed on Coinbase, Gemini, and Changelly. GDAX and Coinbase are from the same people. So if you have a Coinbase account (you have one right? 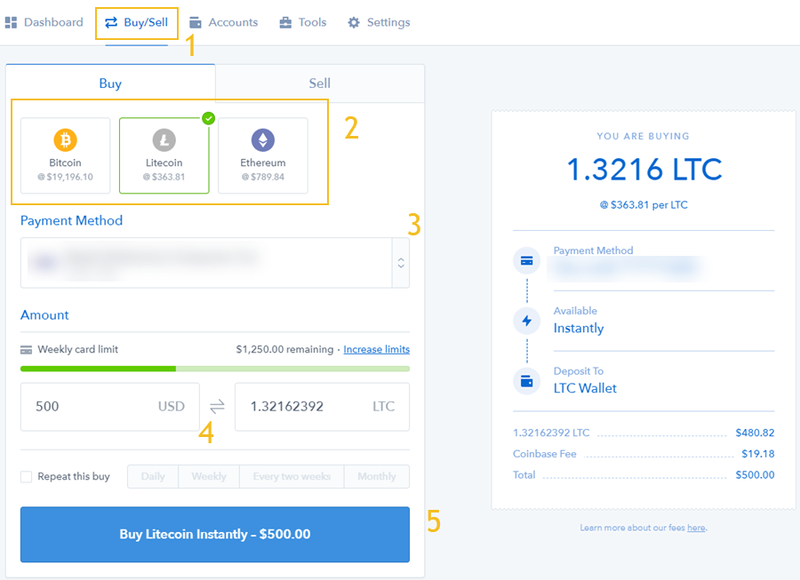 If not, click here to get your Coinbase account setup), then you’ll be able to use GDAX to trade, send, and receive the coins that Coinbase supports with fewer fees. As of this article, they only support Bitcoin, Ethereum, and Litecoin, with plans to add more soon! Binance is one of the largest exchanges out there with one of the greatest selections of markets. It’s one of the more simple exchanges to use. Bittrex is another large exchange that I use frequently. Make sure to verify yourself, otherwise you will not be able to withdraw. Kucoin is one of the first exchanges that I used, and one that’s easy to use as well. Cryptopia is an exchange based in New Zealand that offers some coins that I haven’t seen on Binance, Bittrex, and Kucoin. There are dozens of other exchanges – I only listed a few trusted ones that I use. Do your research on World Coin Index’s list of cryptocurrency exchanges and see what coins are listed on your exchange of choice. Note: Some exchanges such as Bitfinex do not allow people from the United States to sign up and have an account. Every wallet and exchange has a different setup, so it would be extremely time consuming for me to get into all of them. If you need step by steps on each wallet or exchange, they should have an FAQ section. I’ll show how to send and receive in both Coinbase and Binance. 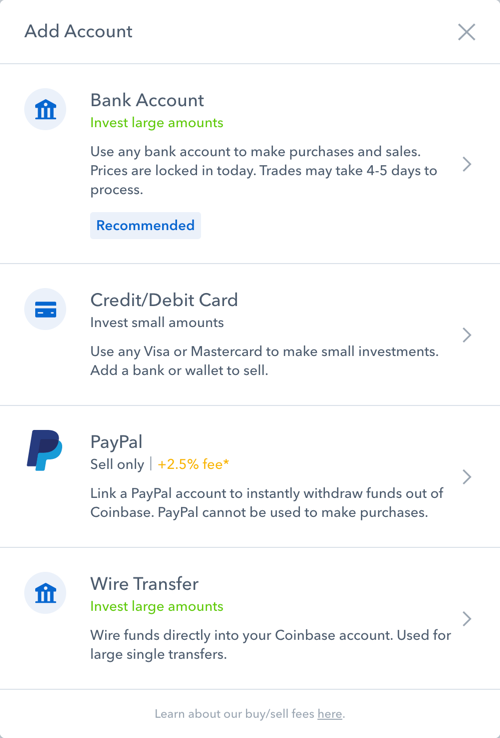 Click the “Accounts” button in your Coinbase Dashboard. 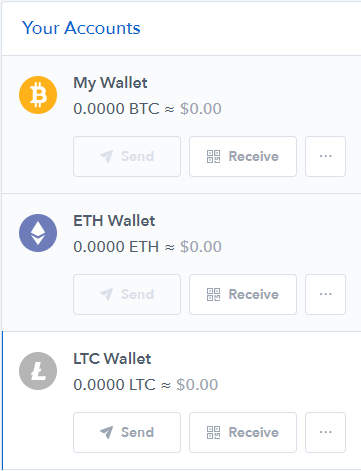 To send, click send and make sure you have the correct address, then input the amount you want to send in USD or the amount you want to send in the respective cryptocurrency in the next box over. 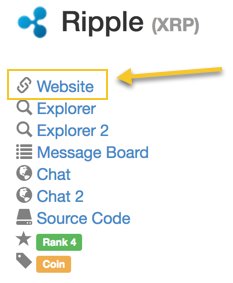 To get the address someone can send you some cryptocurrency at, click the receive button. You can get the address, as well as a QR code, that you can receive cryptocurrency at. Make sure you’re only sending Bitcoin to a Bitcoin address, Ethereum to an Ethereum address, etc. If you make a misstep on that, your money could be gone forever. As I mentioned, every wallet and exchange is different, so I wanted to show another exchange. When logged into Binance, look to the upper right and you’ll see the “Funds” button. Scroll over it to get to the “Deposits Withdrawals” link, and click that. You’ll find their listed cryptocurrencies here, and once you found the cryptocurrency you want to send or receive, click the respective button based on what you’re looking to do. If you want to withdraw from this account and put it into another account, put the other wallet’s public address in the address key, and the amount of the respective cryptocurrency you want to send over. Then click submit. Note: Copy and paste the address you’re sending to. Double check after you’ve pasted it to make sure it’s correct. Triple check, slowly. If one thing’s wrong, your money could be gone forever. Another note: Sometimes, sending and receiving can take a while. In some cases, Bitcoin has been known to take a day to transfer. Ethereum tends to be quicker, but with its rise of popularity, it’s seen some network congestion. Don’t freak out if it takes a while. You’ll get notifications from both Coinbase and some exchanges like Binance when it’s been received and sent successfully. With your bank account or Paypal account linked, you can sell as much cryptocurrency as your weekly withdrawal limit allows. In “Buy/Sell”, click the “Sell Tab”. Choose which wallet you want to sell from, and where you want to deposit to. 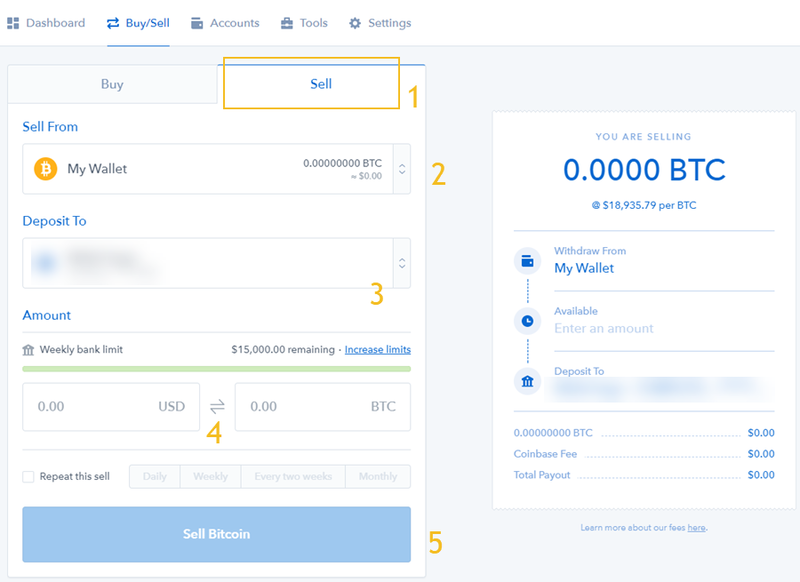 The fourth step is inputting either the amount in USD that you want to sell, or the amount of cryptocurrency you want to sell. Finally, click that blue button, and sell! Hot wallets are the cryptocurrency wallets that you utilize in your online exchanges such as Binance, Bittrex, or GDAX. They’re very convenient, because you don’t have to worry about downloading a wallet application or spending money on a hardware wallet. As convenient as they may be, they come with a couple huge flaws. If you have a secure password and 2 factor authentication enabled, you’re still not safe. The main concern is hackers. If they compromise the information stored within the exchanges, they could potentially have access to everyone’s money. Secondly, you do not own your private keys on the exchanges. Unlike a cold wallet such as a hardware wallet or a paper wallet, the hot wallet private keys are owned by the exchange. This is a type of “hot wallet” that sits on your hard drive. An example of a software wallet is Exodus. This wallet supports cryptocurrencies such as Bitcoin, Dash, Augur, Ethereum, and Litecoin. Most software wallets allow you to export and download your private keys. The major security flaw of these is potential hackers, and they can fall victim to viruses. If you’re going to use a software wallet, make sure it’s on a dedicated computer that’s only used for cryptocurrency to minimize the risk of any cyber attacks. Paper wallets are exactly what you would think they are. They contain your private and public keys. This has the advantage of not being on your computer and thus not being susceptible to hacking. The main disadvantage to this method is that just like all paper, it’s very fragile. If you get it outside into the rain, you leave it out in the sun, it catches fire, or a wind gust catches it, your wallet is gone forever (unless you made a backup or two). Use proper care, and store your paper wallet in a fireproof safe for safe keeping, or a safety deposit box at your bank. Hardware wallets are the most secure type of cold wallet out there. The awesome thing about a hardware wallet is that it essentially acts like a key. Your coins and tokens are NOT stored on the device itself. This means that if you lost your hardware wallet, dropped it in the pool, ran over it, or got it stolen, all would be safe if you had the respective recovery seeds to restore it, which we’ll get into in a moment. Your best (and most budget friendly) options are the Ledger Nano S and the Trezor. 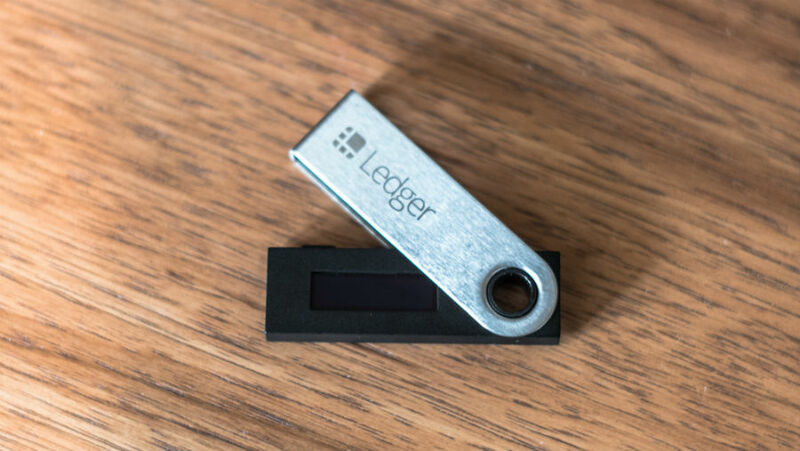 I highly recommend the Ledger Nano S, for the simple fact that it allows you to store all the major cryptocurrencies, as well as a lot of the up and coming alternative coins on them as well. Likewise, Trezor has been working hard to keep up as well. I use both, and like both a lot! The Ledger Nano S is so small, you could fit about 10 of them in your pocket with no problem. What makes a hardware wallet so secure? On both the Trezor and the Ledger Nano S, you are given a random list of 24 words in a specific order. With your hardware wallet, you’ll get a sheet of paper where you can write them down in order. These are not generated on your computer and will be generated directly on your advice. So even if your computer was compromised, your recovery seed would be safe. You’ll be required to create a pin, and you also have the option of an optional passphrase, which adds an extra layer of security. For the long term holder, you need a hardware wallet. Not only are they easy to use, they’re about as secure as you can get. This should go without saying, but you should keep all your sensitive information offline. Keep your wallet recovery seeds written down on paper (or engraved in steel, if you wanted to go that far) for maximum security. Reason being – if your computer or account is compromised, you won’t have a digital record of any of it. 2 factor authentication, in a nutshell, provides an extra layer of security on your accounts by means of you manually verifying that you’re actually the one logging in. Via SMS. You’ll receive text messages to your phone number when you try logging in or making a transaction. Via an authenticator application. 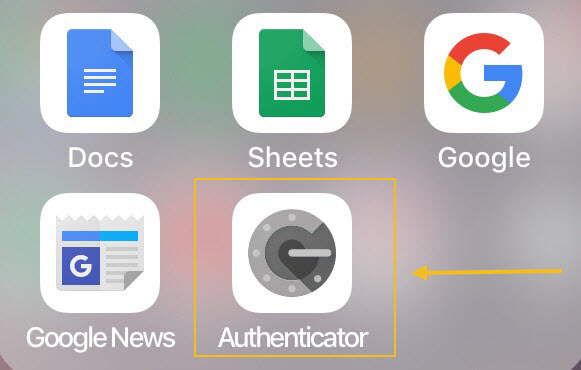 Some exchanges and applications allow Authy, but the vast majority use Google Authenticator. They are both apps that you can download on your phone. Keep the information handy that they give you upfront to being able to disable 2 factor authentication, because you’re out of luck if you lose or break your phone. Your old phone’s authentication will not work on your new phone unless you set up 2 factor authentication again. 2 factor authentication is a must, and an authenticator app like Google Authenticator is the most secure. In a professional capacity, I won’t suggest what you should and shouldn’t buy. As Donovic Media focuses on companies on businesses that deal with blockchain technology, it would essentially be a conflict of interest. I’m also biased because I have a diversified portfolio that deals with a few different companies, coins, and technologies. Do not listen to one person’s recommendations or fall into propaganda or “shilling” (more on shilling in the Terminology You Should Know section). Doing your own research is crucial to making sound decisions and investments. With hundreds (if not over a thousand) viable options to invest into, how do you go about effectively doing research? Well, here’s a few suggestions. CoinMarketCap will be your cryptocurrency go-to for just about everything. Here, you can see the market capitalization, the current price, the circulating supply, total supply, and historical charts with prices relative to USD, BTC (Bitcoin), and ETH (Ethereum). This is ground zero for all your research, and where you’ll be able to get information such as their whitepaper. Your safest bet is going to CoinMarketCap, selecting your coin of choice, and selecting their website in the left side of the screen. See an example below. Forums such as BitcoinTalk are not just about Bitcoin anymore. You can find a fair amount of valuable information here. The place to start would be the CryptoCurrency subreddit as they talk about all cryptocurrencies. There’s some comedy such as memes, but you can find a lot of questions, ask your own questions, and contribute to some very focused discussions. Via CoinMarketCap, you can find some of your favorite coins’ Twitter accounts and follow them. You can also find great groups of like minded folks on Facebook groups where people discuss trading strategies, price predictions, etc. LinkedIn is also a very good social media network to connect with people investing in cryptocurrencies as well. For most average people, buying and building a computer setup with large clock speeds and the best GPU on the market isn’t too economical. It uses a lot of energy and may be too complicating to set up. Mining rewards get more and more sparse as time goes on, as is the case with Bitcoin. With an expensive rig and lots of energy spent, it can take over a month to mine just one Bitcoin. Hardly worth it for Bitcoin, but much more attainable with other coins. However, if you are determined to take part in mining for cryptocurrencies as opposed to outright purchasing them, consider a cloud mining service such as Genesis Mining. You pay a one time fee and slowly earn your desired cryptocurrency over two years (or whatever the contractual agreement may be.) I only can recommend this if you feel that the cryptocurrency’s value will go up a lot in that time frame. Otherwise, it could just end up being a slow way to gain over the course of two years instead of buying upfront and realizing those gains in that same time frame. When doing your research, you’ll see so much terminology thrown around that you’ve never seen before. Once you learn what they mean, you’ll get used to the terminology, and it’ll make your research easier and more enjoyable. This simply refers to cryptocurrencies or the cryptocurrency market, depending on the context. Currency issued by a government, such as the US Dollar, the Euro, or Pounds. All time high. The highest price the coin/token has ever achieved. Simply means “hold”. It was misspelled on a forum years back. Some will say that it means “hold on for dear life,” which works as well. This is when a person or company acts in their own self interests and promotes a coin, token, or project wholeheartedly. They focus only on the positive and tend to ignore or downplay any negative concerns. Fear of missing out. People will see uptrends in the charts, lots of volume being traded, or news and don’t want to miss out on making gains. This can sometimes work for or against people and can result in panic buys, thus causing a temporary spike up in cryptocurrency prices. Fear, uncertainty, and doubt. This is essentially the opposite of “shilling” and causes a lot of negative feelings towards a coin, token, or project. This can cause dips or crashes in prices. When someone says “to the moon!” they generally mean that the price is going to shoot way up. Same thing with “mooning” – If the price has spiked significantly, you can refer to that level as mooning. Just like in stock market terminology, a bull run, bullish market, or bullish trend is when prices are going very well. It can also refer to the future expectation that prices will increase. The opposite of bull / bullish. A bear market or bear trend is when prices are not going well and can refer to the future expectation that prices will decrease. Initial coin offering. Just like a company’s IPO (initial public offering), this allows people to get people in on investing in a coin or token before it’s released to the mass public via exchanges. Circulating supply of the coin or token multiplied by its current price. I’ve made many good decisions since first investing in cryptocurrencies, but I’ve also made mistakes. I’ve also heard of a lot of other people making mistakes. The entire point of this guide was to make it easier for you, and for you to minimize your mistakes. If I save one person the headache of having to figure something out where there was no simple source, I’ll have considered this guide a success. So, to end this guide, I want to offer some final tips. Do not bet the money you’re counting on to pay rent. Do not take your life savings and dump it into cryptocurrency. Of course, things could work in your favor. But it’s certainly not worth the headache you’d be causing yourself by having to stress about crucial money and whether or not you’ll lose money. Yes, it can be very exciting to see your portfolio tracker go higher and higher, but don’t make it your life’s mission to check every fifteen minutes. Unless you’re a day trader, it’s not healthy to check in all the time. Instead, check your portfolio a few times a day or less, and you’ll be able to sleep better. Lastly, stay humble. We’re all in this together. We have all invested different amounts, believe in different technology that’ll change the world, and diversified our portfolio differently. We all started somewhere. Share your excitement about the market as a whole going well, or a particular coin you decided to invest in just skyrocketing, but don’t brag. Help people when you can with any knowledge you may have picked up along the way. Pay it forward. For people who didn’t know how to get started, I hope this helped you. If I helped, please consider clicking the links in the article and signing up for accounts that way. A few are affiliate links that will give me a little something when you sign up and purchasing something. I wouldn’t recommend a site or product without actually using it myself, and I use these all the time.